A lot of the comments you all had on each others’ work I agreed with. Which again, should be pretty good evidence that your peers can give good advice too. It’s not just about me. If you don’t feel like you have enough experience yet to apply for the kind of job you want after you finish your degree, then you should do things to try to get that experience. 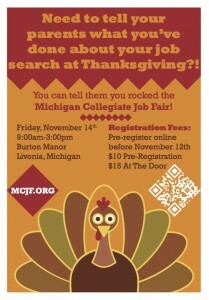 Check out the job fair stuff coming up this Friday! ONE PAGE! That’s it. This is especially true for the level of experience you all have and the kinds of positions you’re all applying for. As a general rule of thumb, unless a) the potential employer specifically asks for a multipage resume that details everything you have done and/or b) you are applying for an advanced position and you can’t fit your 15+ years of professional experience on to one page. Then, and only then, more than one page might– might!– make sense. Also, in terms of the order of things: if you are applying for a job that requires a college degree (and I assume that’s the case for everyone), then your education probably should go first. One more thing about resumes and cover letters, something I forgot to mention in the video: go back and look at the readings! I don’t know how accurate this is, but it kind of seems to me that a lot of you kind of ignored the advice we read and discussed on how to put together a resume and a cover letter. That’s obviously a problem in all kinds of different ways. Final versions of the resumes and cover letters are due by the end of the day on Friday, November 14. Also, if you have thoughts on the process here– that is, me commenting like this before you turn in the final version– let me know what you think in the comments on this post. Peer review of the informal report assignment will start this coming Monday! I’ll set up groups over the weekend, though it will probably be the same peers as you just worked with for the resume/cover letter groups. Remember that your informal report is supposed to be about an event that happened at EMU. If you are doing it about something else, you need to let me know about this! The final version of these will be due on the Monday before Thanksgiving, November 24. Another progress report is due this Friday– post a link to them at the same place you posted them before! One of the things you certainly should start doing for this project is research, both research about the proposal in general and on-campus research. I describe an example of what I mean in the video here. One thing I didn’t mention in my video: some of you are working on proposal ideas that probably aren’t realistic given the money involved. Sure, $5 million is a lot of money, but it isn’t enough to build a new building on campus. Just to give you an idea: EMU has been wanting to remodel/refurbish Strong Hall for years, and they estimate that project as costing $48 million. So again, do some research, ask some questions, etc. About that job fair on Friday! This was helpful! Thanks for posting. One quick question: do we need to reference the readings in our memos (formally, with citations)? I have been wondering about this. Or are just general references/connections that we thought of or utilized when writing acceptable? I appreciated the new process of peer review where Professor Krause provided feedback after our group members commented on drafts. I found it helpful to have Professor Krause’s comments along with the peer comments. Even though there was a lot of “I agree”s, as stated in the video, I feel more confident about what to do going in to editing. Also, I enjoy that we’re doing the progress reports on the Formal Report Assignment – I feel like it makes the assignment easier to manage. I also like the new editing process as well. I feel like I have a much better idea of what Professor Krause looks for while he reviews my assignments. It’s nice to have that information ahead of time instead of after turning in the final version. I think this was all very straight-forward, I just wanted to add that I also appreciated your comments before turning in the project. Helps me get a better idea of what you’re looking for. I have kind of mixed feelings about the “now I know what you’re looking for” sorts of comments, to be honest. On the one hand, part of what I want to emphasize/teach you to do here is to learn what your audience wants, what you sense is appropriate given the rhetorical situation here. This is a critical skill you need to develop in yourselves as writers because if you are going to keep writing in any professional sense, you are going to be writing things for an audience that you don’t know well and an audience that isn’t going to give you direct feedback from a teacher. On the other hand, I can understand the realities here, that this is a class and you want to get a good grade, and I’m the one who gives you the grade, etc. Further, while your fellow students clearly give you good feedback on your writing (I see this all the time), I am the one here who has the most experience and expertise on this stuff. I’m not saying my opinions about your writing are better; I’m just saying they are probably more informed. And besides, most of my comments are completely in line with the comments of folks in your groups. So if me coming through and saying “I agree with this” helps reenforce the value of your peer’s comments, then I guess it’s a good thing. I agree with the Professor. I do like the fact that he adds comments, but I also like the fact that my classmates can say things too. I read what they say and make the corrections and send it back to them (it’s proofreading at its best) and I feel really comfortable with what they say about changing my papers and seeing things from a different perspective. Sure I want to get a good grade, but I also know that as in life, we have to sometimes go on what our friends, family and co-workers tell us. We can’t always let “the boss” (in this case Professor Krause) dictate exactly what he/she wants each and every day. They want to see how creative we can be, can we stand on our own and make changes by ourselves and stick with what we wrote on paper. If this were a class where we all wrote according to some guideline(s) we would all write the same and get a grade according to these guidelines. We would be able to express our opinions, we would just be going through the motions. Boring. I feel that each and everyone of you guys are giving me the right corrections on my paper(s) and I am happy with the grades I am getting in this class. I am also learning a lot about different types, styles and skills from you guys and I hope this continues.